Web has become almost ubiquitous with our daily chores. Take for example – When we sit before our PC/Laptop, how many of us start typing the letters “F” “A” “C” and choose “facebook.com” from the drop down and then wonder why we chose it? Such is the impact of the Web on our routine activities. Research says Internet has changed the way we remember facts. Rather than remembering the birthdate of our best friends, we just rely on Gmail reminders. Don’t we? The amount of information generated in the World Wide Web each day is unimaginably high. 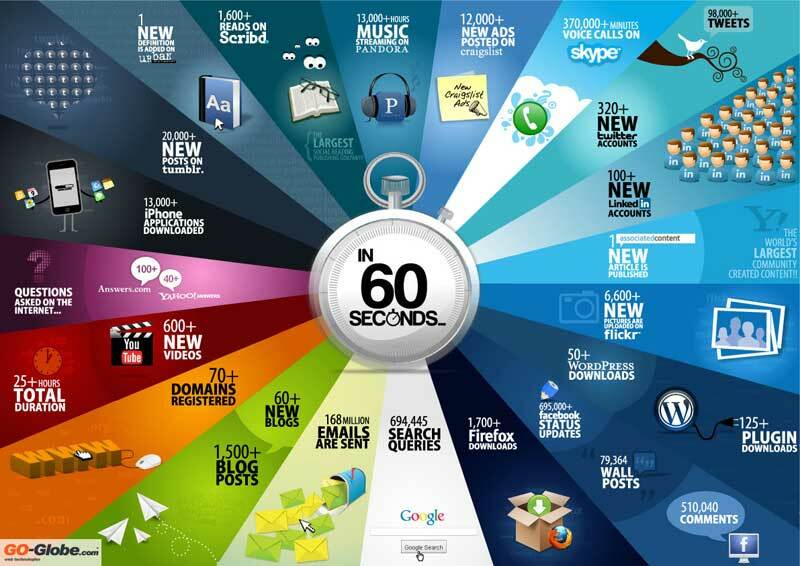 What could be done in 60 seconds? Sounds trivial? Well, let me allow the picture to speak for itself. This mammoth network of networks wasn’t built in a day. The web has seen a phenomenal growth since its inception. Web 1.0 – The Read web. People could just read the contents articulated by others. One-way communication. Web 2.0 – The Read, Write Web. People could comment on what others said. Thus started the era of blogging. Two-way communication. Web 3.0 – The Read, Write, Execute Web. People share their ideas. And the system processes and understands the information it has obtained from various authors and suggests the contents which a particular person would be interested in. That’s why he call it the Semantic Web. Suggestion Engines, Mashups, Micro-blogging etc. make the Web much more interactive. The Internet we are witnessing now is something larger than life. Something we are depending on so heavily that one day we might even forget our own names and check our Google+ profiles to get them. The future of Internet, I believe, would be to make an unified ecosystem wherein it would be possible to get the same amount of data storage and processing power from any kind of device connected to the internet. Below is a wonderful infographic on how far the Internet has catapulted from humble beginnings to colossal heights.